Spring has sprung and for me, that means more salad. So I got to thinking about that word salad, which I realize means so many things that I was never able to fit all of my salad recipes into a file folder simply marked “salad.” I had to sub-categorize them into files such as “grain salads,” “tomato salads,” “fruit salads” and so on. Over the years I’ve made salads of all sorts. Some based mostly on greens and some that had no greens at all. I’ve made beet salads, dinner salads, fish salads and quinoa salads. Because recently I prepared some Matbucha, which is in an entirely different salad category. Cooked salad may seem odd to Western thinking except for the fact that most of us actually eat lots of cooked salads, such as potato salad and egg salad too. We just don’t think of them as “cooked salads,” but that’s what they are. Matbucha is a Moroccan dish, especially popular in the Moroccan Jewish community, which was once large and thriving in North Africa. When good numbers of Moroccan Jews migrated to Israel, they brought their love of this dish with them and it is now wildly popular in Israel too. For good reason: Matbucha is vibrantly tasty, easy to cook and is ideal for Shabbat because, even though it’s cooked, you can serve it at room temperature. Use it as a salad course or as a side dish with dinner. I’ve always served it with hors d’oeuvre, as a topping for crackers or pita wedges (it works well with other Middle Eastern nibbles and dips such as hummus, raheb, baba ghanoush and so on). You can make Matbucha 3-4 days ahead. That’s handy isn’t it? Preheat the broiler. Place the peppers under the broiler, about 4-6" away from the heat, and broil for 2-3 minutes, until the skin has blistered. Turn the peppers and repeat this process until the entire surface is blistered and lightly charred. Remove the peppers and place them in a paper bag. Let rest at least 10 minutes. Remove the peppers from the bag, peel off the skin and discard the stem and the seeds. Cut the peppers into pieces. Heat the olive oil in a large saucepan over medium heat. Add the peppers, serrano pepper and garlic and cook for 2-3 minutes. Add the tomatoes, paprika, sugar and salt. Bring to a simmer over medium-high heat. Cook for 30-35 minutes, until most of the liquid has evaporated and the mixture is thick. Purim is a loud, raucous, festive, hilarious holiday. Although its origins are somber - Haman’s attempt to annihilate the Jews of ancient Persia - it didn’t end so well for him. But it did for us and, in keeping with the victory we celebrate! And so, on Purim, count on the fact that wine will be on the menu somewhere. This year I decided that wine would appear on my dessert menu. I’ll poach some seasonal pears (I prefer comice or bartlett) in a hearty, aromatic wine-based sauce. I’ve made this dessert many times (tastes different each time of course because I use a different wine). You can make it a day or so ahead; store everything in the fridge. Serve it with the sauce, strained and boiled down to a velvety finish, and maybe a garnish of whipped cream, ice cream or sorbet. Or just by itself. Combine the wine, water, sugar, orange peel, lemon peel, cinnamon stick, allspice and cardamom pods in a stainless steel, pyrex, enamel or other non-reactive saucepan. Bring the mixture to a boil, then lower the heat and simmer the ingredients for 5-6 minutes. While the sauce is cooking, peel the pears and cut them in half. Remove the core and seeds. When the sauce has simmered for 5 minutes, immerse the pear halves and cook them for about 4-5 minutes or until they are barely tender. Remove the pan from the heat; let the pears cool in the liquid. Remove the pears. Strain the poaching liquid and return the plain liquid to the saucepan. Boil the liquid over high heat for several minutes until it has reduced to a syrupy consistency. Let the liquid cool. When ready to serve, spoon some of the syrup on dessert plates and top each with a pear half. Serve with whipped cream, if desired, and garnish with a sprinkle of crushed pistachio nuts. In our nuclear family of 11, there are the pro-potato people and the no-potato people. I am a top level pro-potato person. 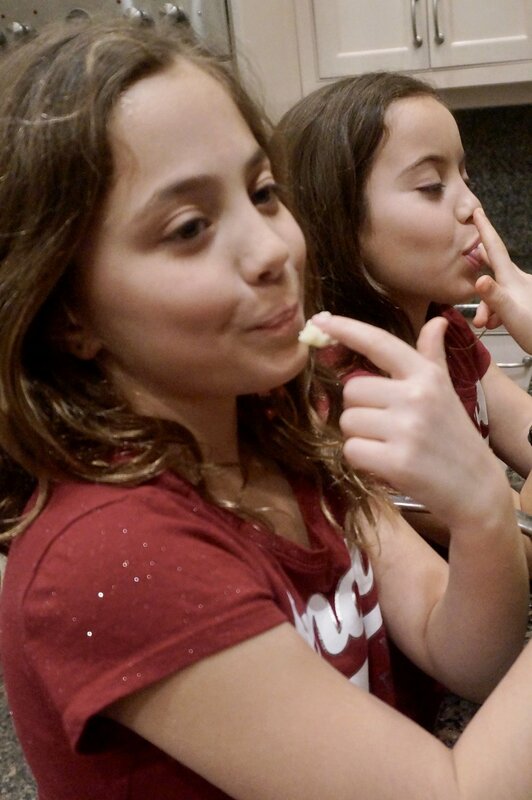 And as you can see from the photos, so are two of my grand daughters, who helped me make some mashed potatoes for dinner a while ago. The recipe we made was a butter-cream-cheese-sour-cream indulgence. (It could be a meal in itself!) But we’ve also made dairy-free versions. Pro-potato people like it all ways. Are mashed potatoes on your menu for Thanksgiving? If so — or any other time — check out both recipes, dairy-loaded and dairy-free. Peel the potatoes and cut them into chunks. Cook them in lightly salted simmering water for about 20 minutes or until tender. Drain and return the potatoes to the pan. Cook briefly over low heat to evaporate the excess moisture. Mash the potatoes with a ricer or potato masher. Add the butter and cream cheese and mash them in thoroughly until the butter and cheese are completely blended in. Add the sour cream and blend in thoroughly. Mix in enough milk for desired consistency. Season to taste with salt and pepper. Preheat the oven to 400 degrees. Peel the potatoes, cut them into chunks and cook them in lightly salted water for about 15 minutes, or until they are fork tender. While the potatoes are cooking, heat the olive oil in a sauté pan and add the onion. Cook, stirring occasionally, for about 3 minutes, then add the garlic. Cook for another 1-2 minutes, or until the vegetables are beginning to brown. Set aside. Drain the potatoes and mash them with a ricer or potato masher until the lumps have disappeared. Add the vegetables and olive oil and stir them in gently. Stir in the lemon juice, stock, salt and the cayenne pepper. Place the mixture in a baking dish. Sprinkle with the bread crumbs. Bake for 10-15 minutes or until the top is crispy and brown. I’ve lived most of my life in Connecticut and so I am used to cold winters, snow and all that comes with it. I don’t mind really. I actually love the change of seasons and think it makes life more interesting. But it’s those first days of chill that take some getting used to as we transition from summer’s heat and the gradual change of temperature when autumn comes.. 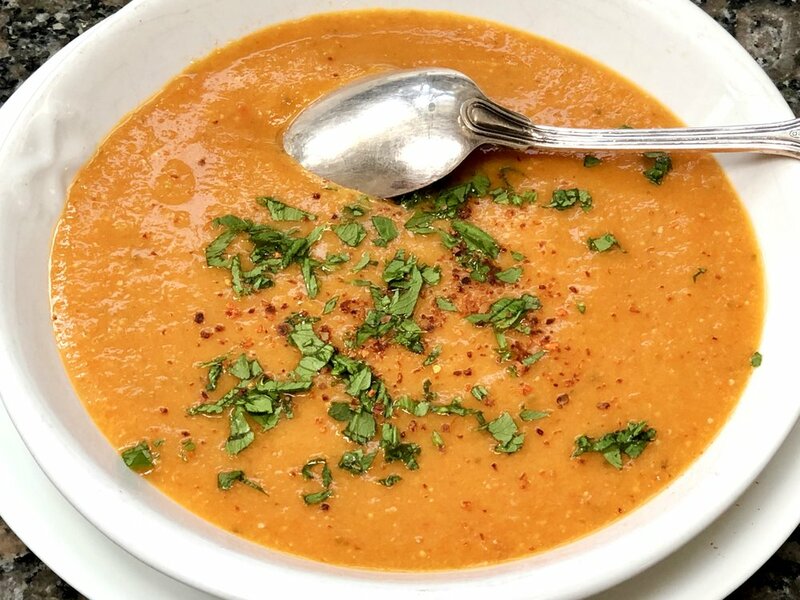 I recently made this Roasted Red Pepper soup. It’s exactly what’s needed when the weather turns. Also makes a good first course for Thanksgiving dinner. Preheat the broiler. Place the peppers under the broiler, about 4-6" away from the heat. Broil for 2-3 minutes, until the skin has blistered. Turn the peppers and repeat this process until the entire surface is blistered and lightly charred. Remove the peppers and place them in a paper bag. Let rest at least 10 minutes. Remove the peppers from the bag, peel off the skin and discard the stem and the seeds. Cut the peppers into pieces. Heat the olive oil in a large saucepan over medium heat. Add the onion, carrot, celery and parsley. Cook, stirring occasionally for 3-4 minutes or until the vegetables have softened. Stir in the rice. Add the peppers and stock. Season to taste with salt and pepper. Bring the mixture to a boil, lower the heat and cook at a simmer for 25 minutes. Puree in a food processor or blender. When I was a kid my mother sometimes made macaroni-and-cheese using somewhat older, hard-around-the-edges American cheese that didn’t look fit to eat. I thought it was appalling. But she told me that these cheese wasn’t spoiled, just hard because maybe it wasn’t wrapped quite so well, and that in any event she would never make any dish for us using an ingredient that could be harmful. And also, why waste perfectly good cheese that’s going to melt anyway. So if it isn’t perfect to eat cold, as is, it is perfectly fine for macaroni and cheese. And it was. She made delicious macaroni and cheese. So recently, I noticed that in addition to some fresh bananas turned black-spotty, my snack packages of applesauce were a month beyond their expiration date. Rather than give the applesauce to my grandkids and have my daughters feel appalled, I used it in chocolate cake, in the place of eggs. Not only was I able to use up a perfectly good ingredient, the cake was delicious and also a good vegan choice. Preheat the oven to 350 degrees. Lightly grease an 8”x8” cake pan. Melt the chocolate and set it aside to cool. In a bowl, whisk together the flour, cocoa powder, baking soda and salt. Set the flour mixture aside. Mash the bananas and place them in the bowl of an electric mixer (or use a hand mixer and bowl). Add the sugar and mix at medium speed for a minute, or until well blended. Add the applesauce, juice, vanilla extract and melted chocolate and beat for 1-2 minutes, or until thoroughly blended. Add the flour mixture and beat for 1-2 minutes, or until throughly blended. Spoon the batter into the prepared cake pan. Bake for 25-30 minutes or until a cake tester inserted into the center comes out clean. Carrots are always on my menu for Rosh Hashanah dinner. This recipe, the one I'm serving this year, is so easy. And you can set it up ahead -- peel and cut the carrots 2-3 days before you have to cook them, and store them in a plastic bag in the fridge. This dish will go with practically any main course you might serve for dinner. Preheat the oven to 425 degrees. Line a baking sheet with parchment paper. Peel the carrots and cut them lengthwise in half or quarters, depending on thickness. Place the carrots on the baking sheet. Pour the olive oil over the carrots and toss to coat them completely. Sprinkle with kosher salt and a pinch of cayenne. Roast the carrots, stirring occasionally, for 10 minutes. Pour the Balsamic vinegar over the carrots, toss and bake for another 8-10 minutes or until they are tender. Sprinkle with chives and serve. You know how, when you have company for dinner and you make a lot of food, you sometimes forget to serve one (or more) of the dishes you cooked? I did that recently. I made stewed rhubarb because my brother was coming to my house for dinner and it's one of his favorite things to eat. Not only did I forget to serve it, I forgot about it in the fridge for a couple of days. It was still good, of course, and we ate some, but there was some left over too. Voila! This is sometimes how good recipes are born. It was well-loved. And if you don't have stewed rhubarb, you could use applesauce or mashed banana. Preheat the oven to 350 degrees. Grease and flour a 10-inch (8-cup) bundt pan. Mix the flour, oats, baking soda, salt and lemon peel together in a bowl. Set aside. In the bowl of an electric mixer beat the coconut oil, vegetable shortening and sugar at medium speed until well blended, about one minute. Add the rhubarb and blend it in thoroughly. Add the eggs and beat the ingredients well. Add the flour mixture and beat until batter is well blended. Pour the batter into the prepared pan and bake for 55-60 minutes or until a cake tester inserted into the center comes out clean. Remove from the oven and let cool in the pan for 10 minutes. Remove to a cake rack to cool completely.